• • • Identity is an accomplishment. Identity is fragmentary and in flux. 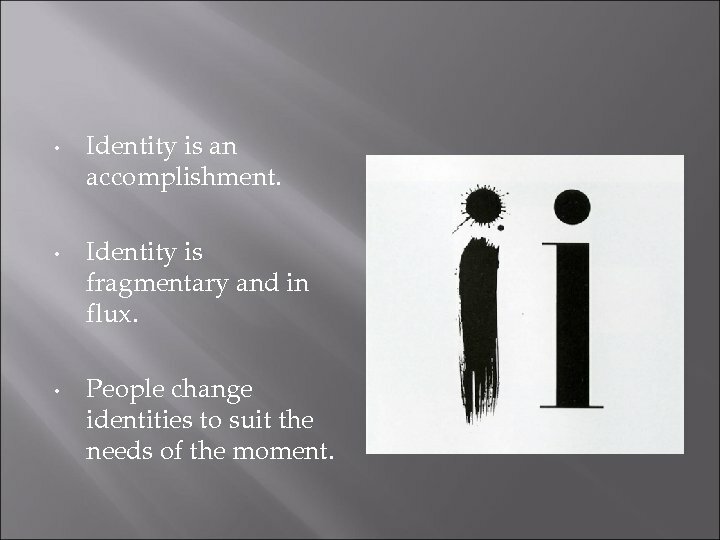 People change identities to suit the needs of the moment. Identities are. . . –The stable features of persons that exist prior to any particular situation (personal/individual). AND –Dynamic and situated accomplishments, enacted through talk, and changing from one occasion to the next (built/fluid). 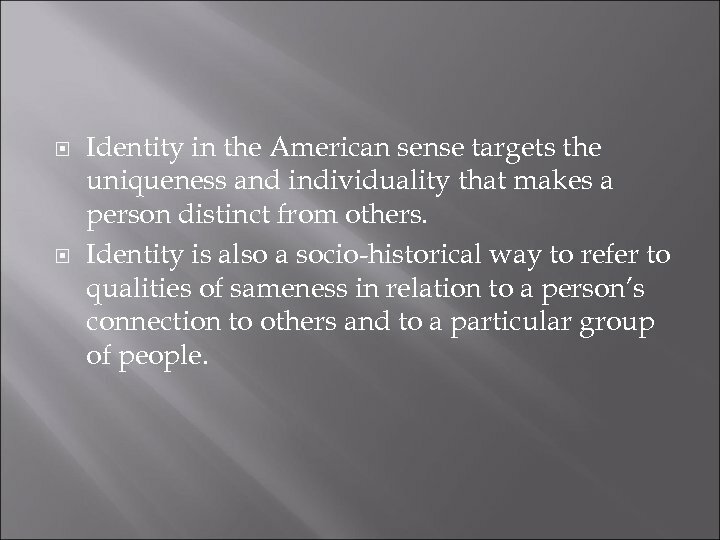 Identity in the American sense targets the uniqueness and individuality that makes a person distinct from others. 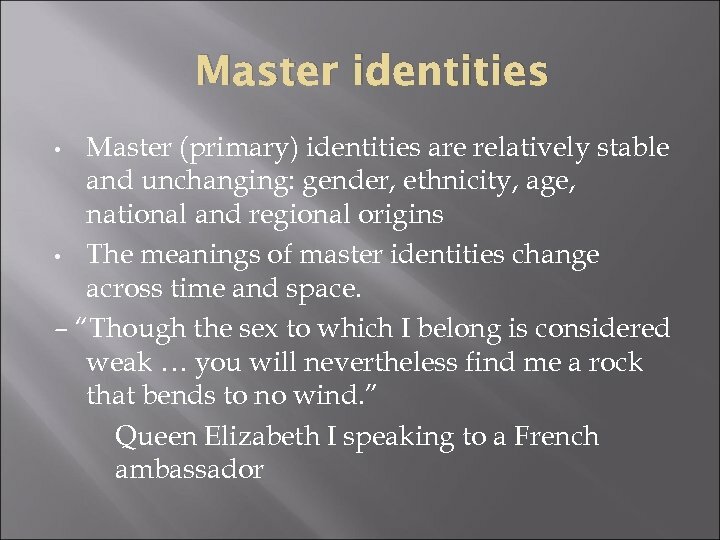 Identity is also a socio-historical way to refer to qualities of sameness in relation to a person’s connection to others and to a particular group of people. 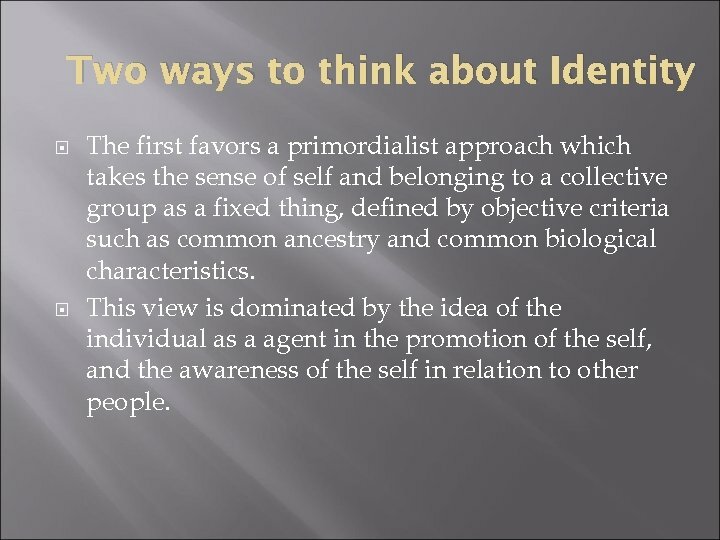 Two ways to think about Identity The first favors a primordialist approach which takes the sense of self and belonging to a collective group as a fixed thing, defined by objective criteria such as common ancestry and common biological characteristics. This view is dominated by the idea of the individual as a agent in the promotion of the self, and the awareness of the self in relation to other people. 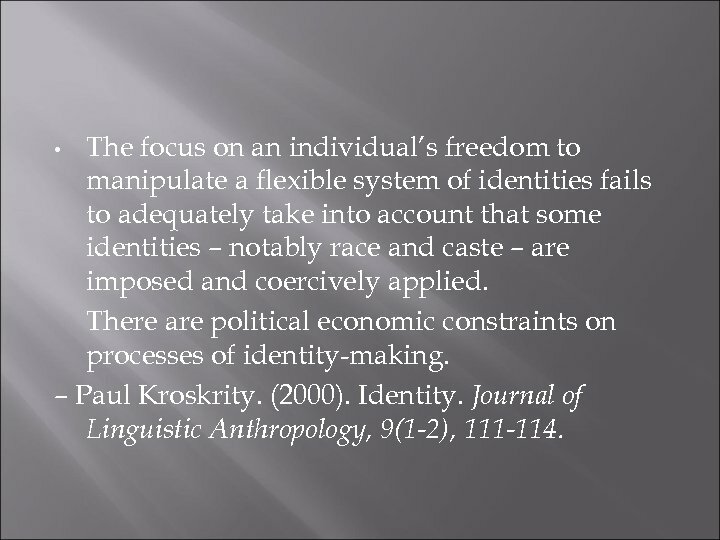 The second, rooted in social constructionist theory, takes the view that identity is formed by a predominantly political choice of certain characteristics. ASIDE: A social construction (social construct) is a concept or practice which may appear to be natural and obvious to those who accept it, but in reality is an invention or artifact of a particular culture or society. 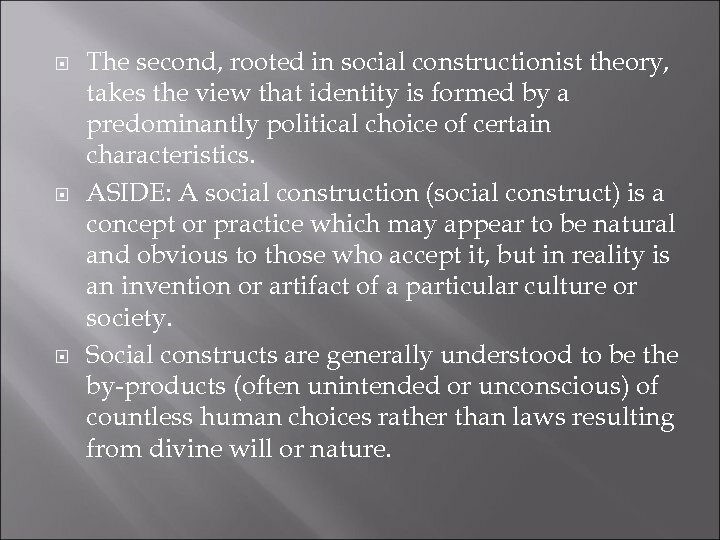 Social constructs are generally understood to be the by-products (often unintended or unconscious) of countless human choices rather than laws resulting from divine will or nature. 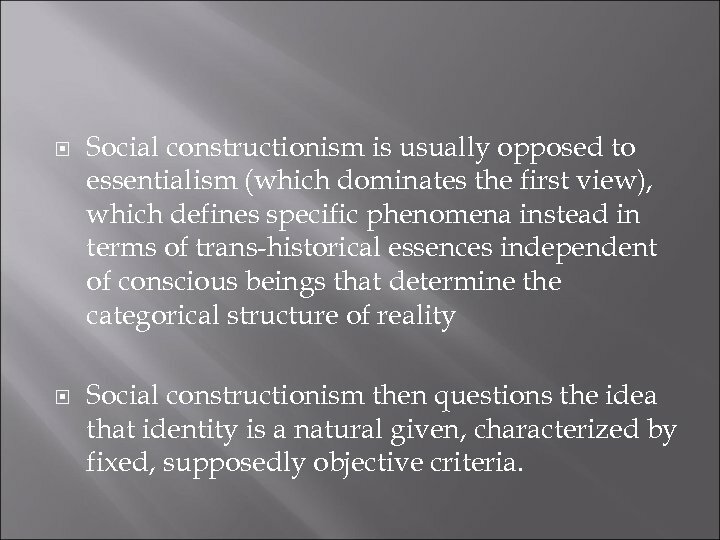 Social constructionism is usually opposed to essentialism (which dominates the first view), which defines specific phenomena instead in terms of trans-historical essences independent of conscious beings that determine the categorical structure of reality Social constructionism then questions the idea that identity is a natural given, characterized by fixed, supposedly objective criteria. 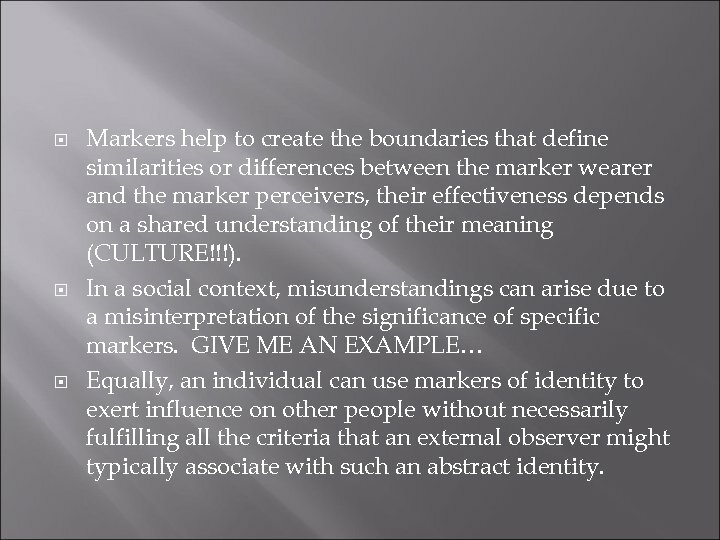 Markers help to create the boundaries that define similarities or differences between the marker wearer and the marker perceivers, their effectiveness depends on a shared understanding of their meaning (CULTURE!!!). 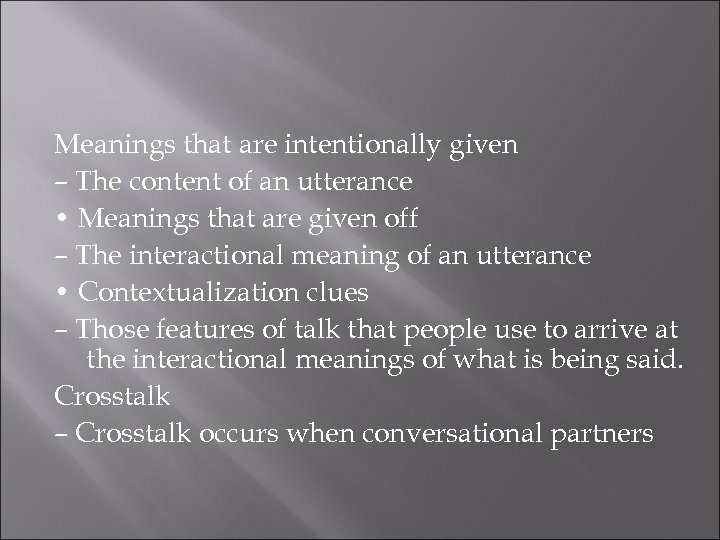 In a social context, misunderstandings can arise due to a misinterpretation of the significance of specific markers. 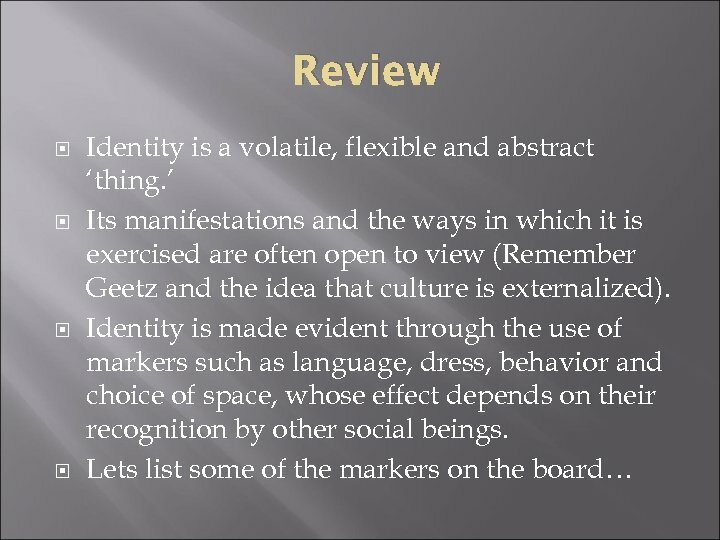 GIVE ME AN EXAMPLE… Equally, an individual can use markers of identity to exert influence on other people without necessarily fulfilling all the criteria that an external observer might typically associate with such an abstract identity. 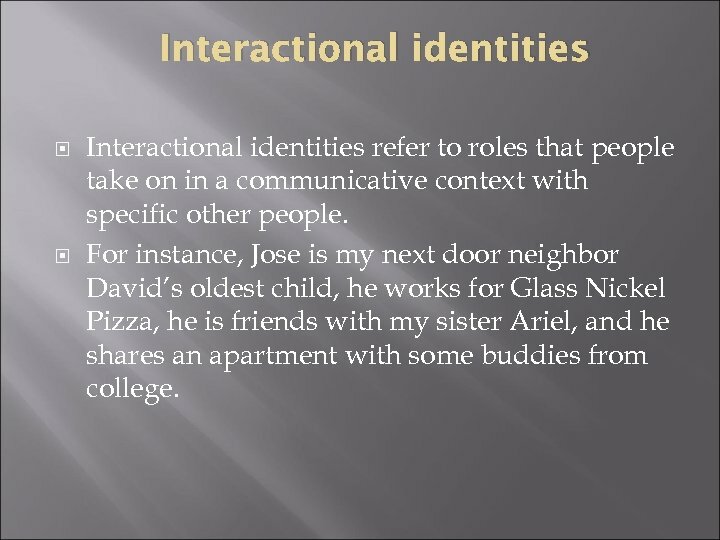 Interactional identities refer to roles that people take on in a communicative context with specific other people. For instance, Jose is my next door neighbor David’s oldest child, he works for Glass Nickel Pizza, he is friends with my sister Ariel, and he shares an apartment with some buddies from college. 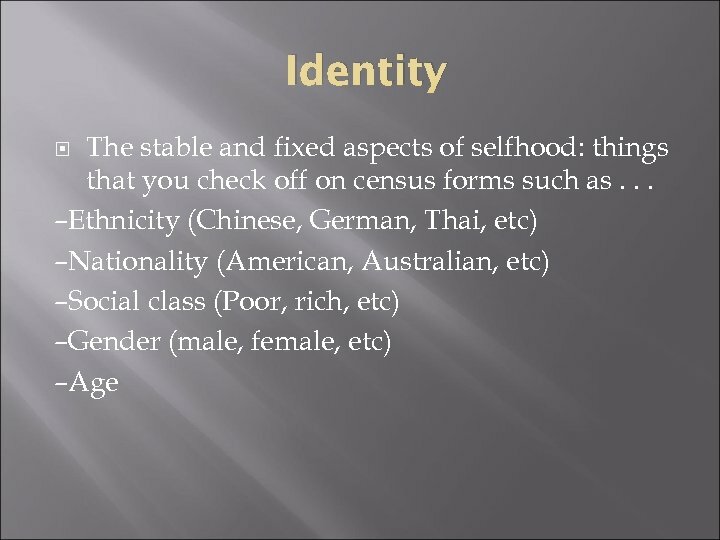 Personal identities are expected to be relatively stable and unique. – often reference ways in which people talk and behave toward others: hotheaded, honest, forthright, reasonable, overbearing, a gossip, a brown-nose (both your own perception and those of other people). 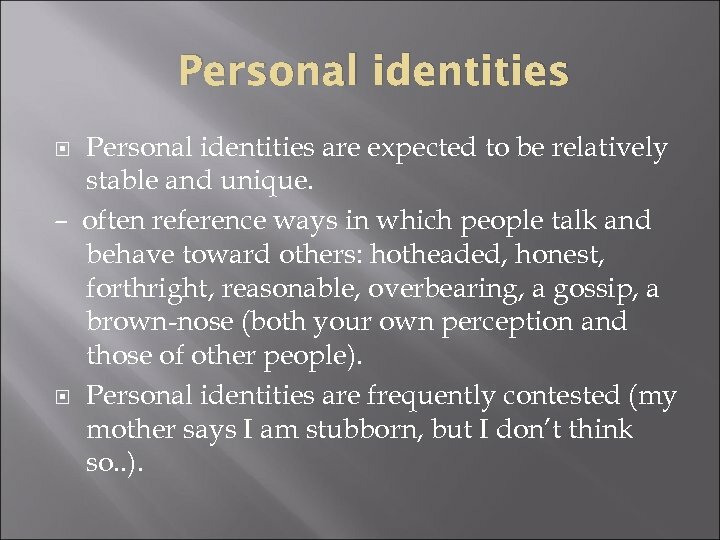 Personal identities are frequently contested (my mother says I am stubborn, but I don’t think so. . ). 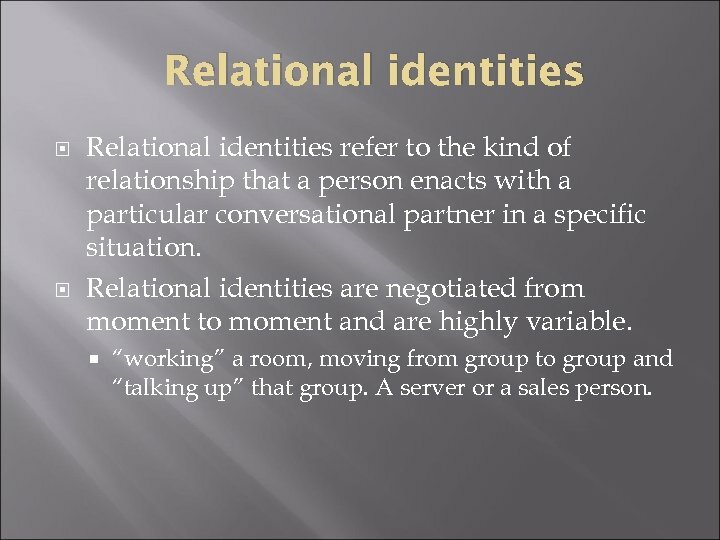 Relational identities refer to the kind of relationship that a person enacts with a particular conversational partner in a specific situation. 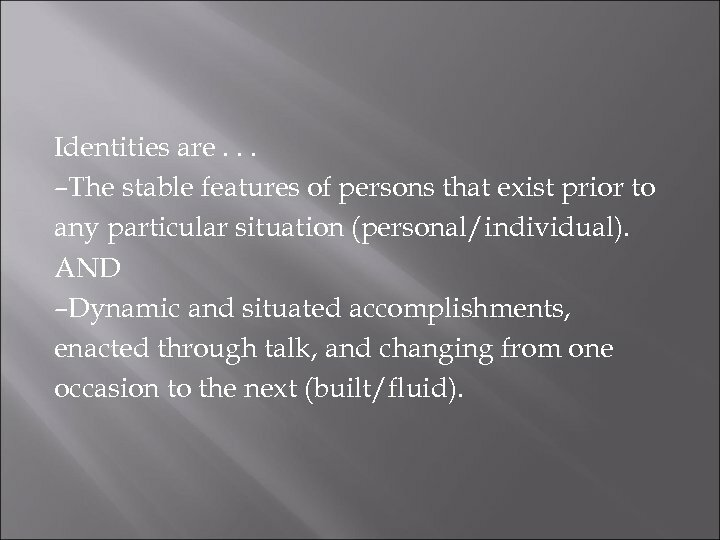 Relational identities are negotiated from moment to moment and are highly variable. “working” a room, moving from group to group and “talking up” that group. A server or a sales person. 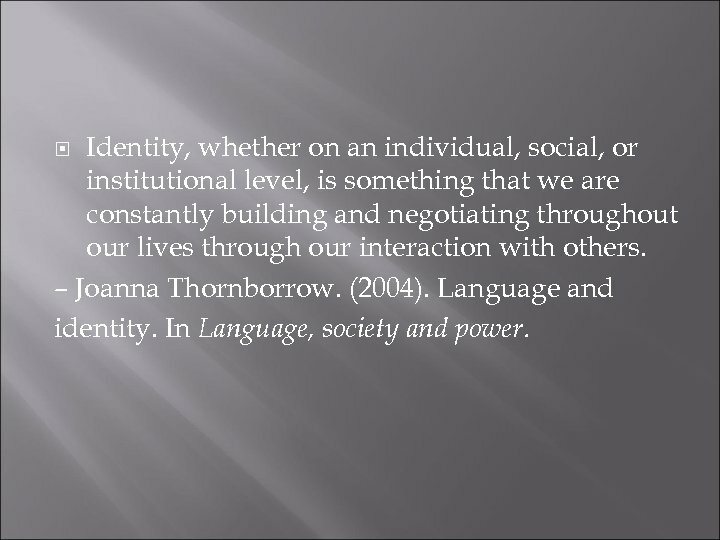 Identity, whether on an individual, social, or institutional level, is something that we are constantly building and negotiating throughout our lives through our interaction with others. – Joanna Thornborrow. (2004). 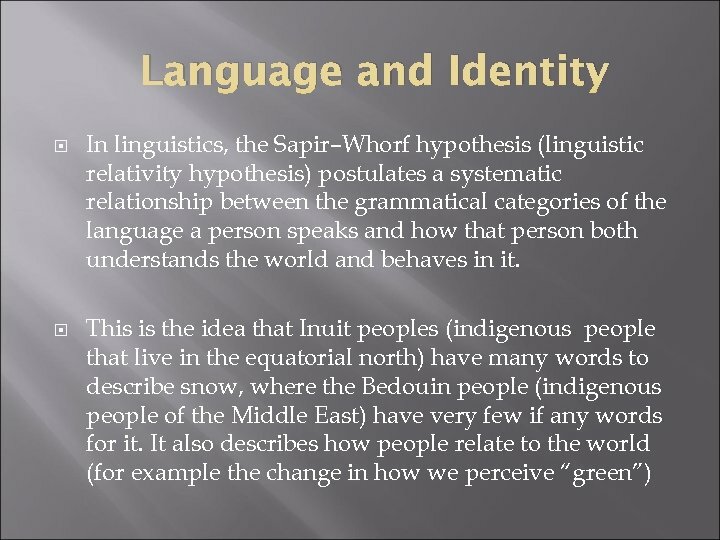 Language and identity. In Language, society and power. 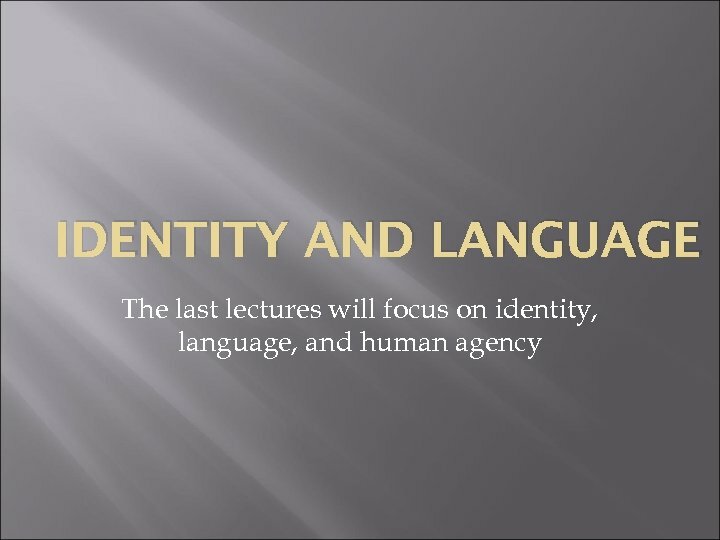 The emphasis is on identities not essentially given but actively produced – whether through deliberate, strategic manipulation, or through out-of awareness practices. This both captures the agency of speakers and views language as social action. – Paul Kroskrity. (2000). Identity. 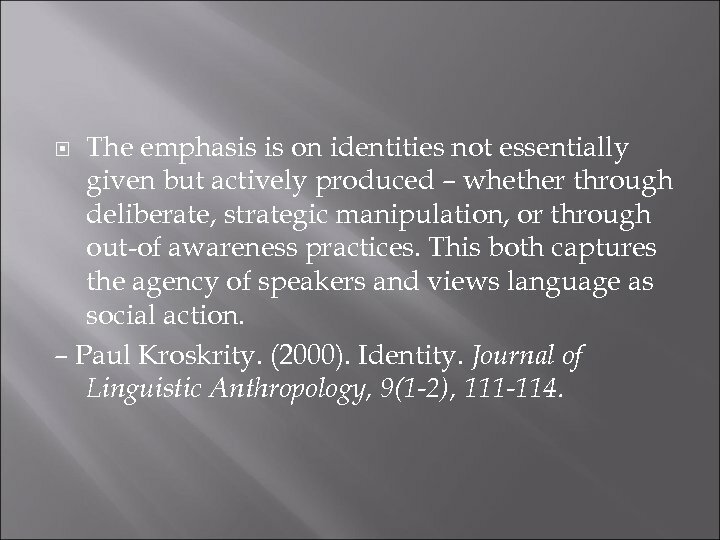 Journal of Linguistic Anthropology, 9(1 -2), 111 -114. 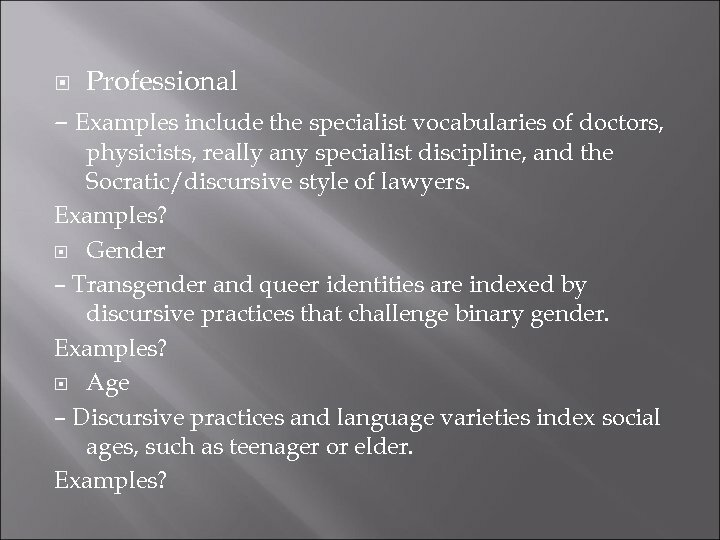 Professional – Examples include the specialist vocabularies of doctors, physicists, really any specialist discipline, and the Socratic/discursive style of lawyers. Examples? Gender – Transgender and queer identities are indexed by discursive practices that challenge binary gender. Examples? 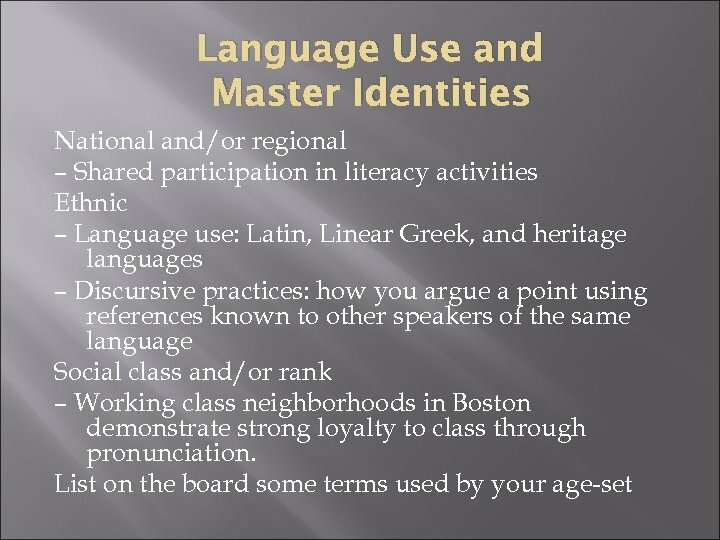 Age – Discursive practices and language varieties index social ages, such as teenager or elder. Examples? 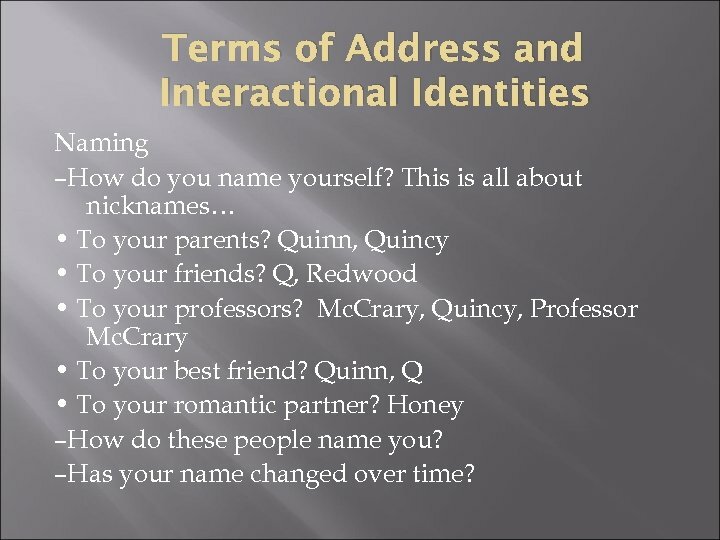 Terms of Address and Interactional Identities Naming –How do you name yourself? This is all about nicknames… • To your parents? Quinn, Quincy • To your friends? Q, Redwood • To your professors? Mc. Crary, Quincy, Professor Mc. Crary • To your best friend? Quinn, Q • To your romantic partner? Honey –How do these people name you? –Has your name changed over time? 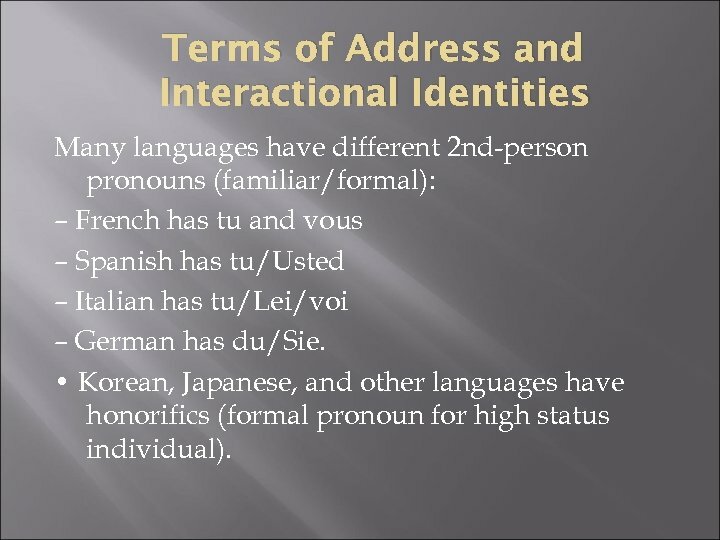 Terms of Address and Interactional Identities Many languages have different 2 nd-person pronouns (familiar/formal): – French has tu and vous – Spanish has tu/Usted – Italian has tu/Lei/voi – German has du/Sie. • Korean, Japanese, and other languages have honorifics (formal pronoun for high status individual). Naming and Personality? 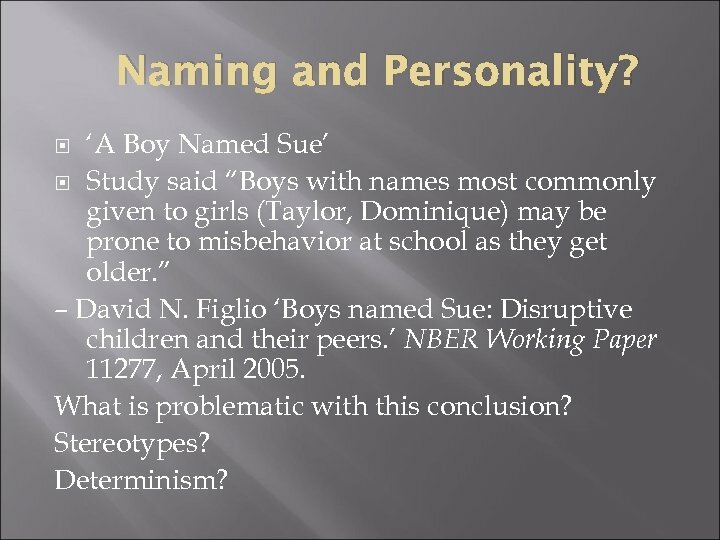 ‘A Boy Named Sue’ Study said “Boys with names most commonly given to girls (Taylor, Dominique) may be prone to misbehavior at school as they get older. ” – David N. Figlio ‘Boys named Sue: Disruptive children and their peers. ’ NBER Working Paper 11277, April 2005. What is problematic with this conclusion? Stereotypes? Determinism? 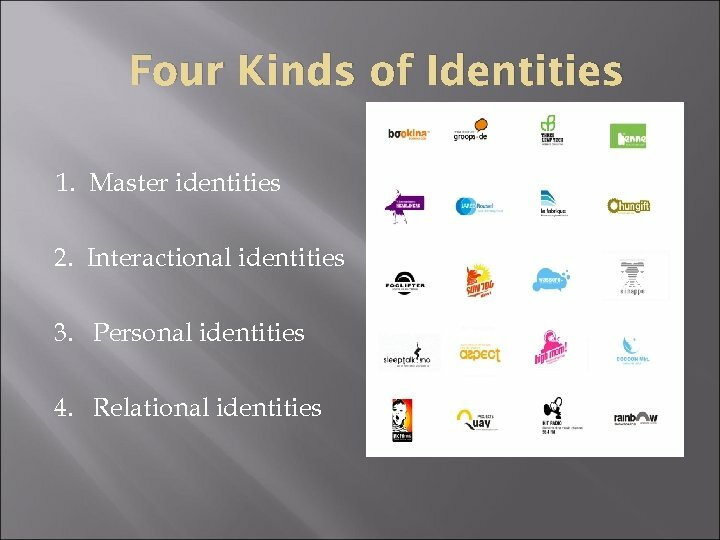 How are relational identities created? 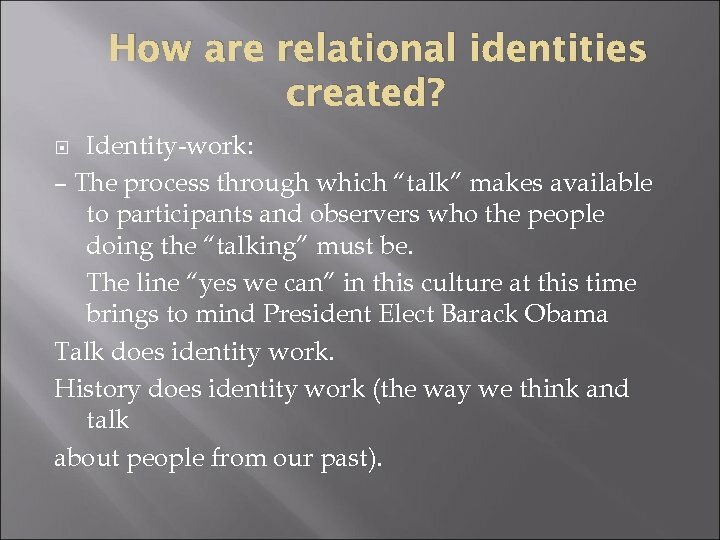 Identity-work: – The process through which “talk” makes available to participants and observers who the people doing the “talking” must be. The line “yes we can” in this culture at this time brings to mind President Elect Barack Obama Talk does identity work. History does identity work (the way we think and talk about people from our past). 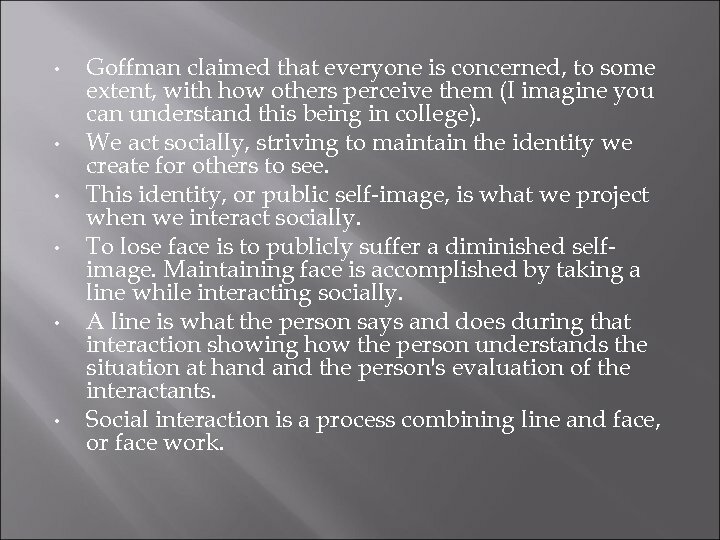 • • • Goffman claimed that everyone is concerned, to some extent, with how others perceive them (I imagine you can understand this being in college). We act socially, striving to maintain the identity we create for others to see. This identity, or public self-image, is what we project when we interact socially. To lose face is to publicly suffer a diminished selfimage. Maintaining face is accomplished by taking a line while interacting socially. A line is what the person says and does during that interaction showing how the person understands the situation at hand the person's evaluation of the interactants. Social interaction is a process combining line and face, or face work. 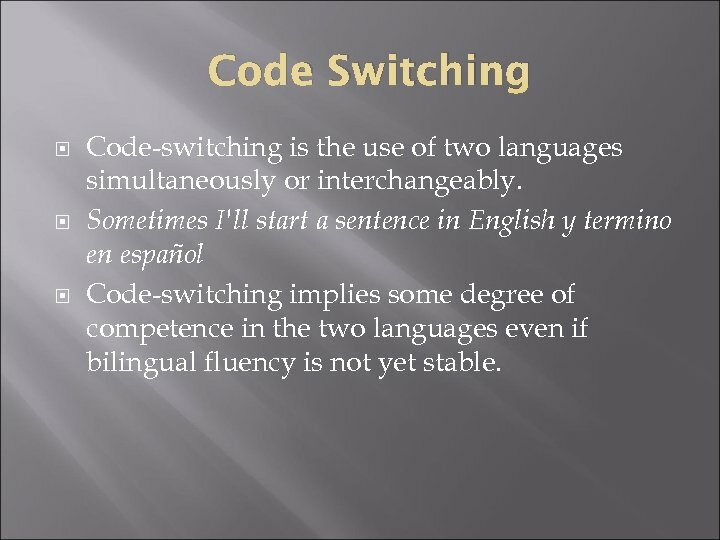 Code Switching Code-switching is the use of two languages simultaneously or interchangeably. Sometimes I'll start a sentence in English y termino en español Code-switching implies some degree of competence in the two languages even if bilingual fluency is not yet stable. 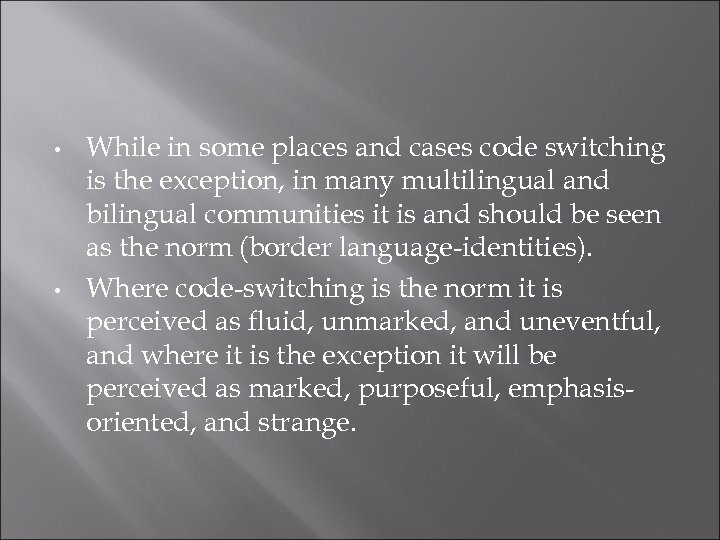 • • While in some places and cases code switching is the exception, in many multilingual and bilingual communities it is and should be seen as the norm (border language-identities). 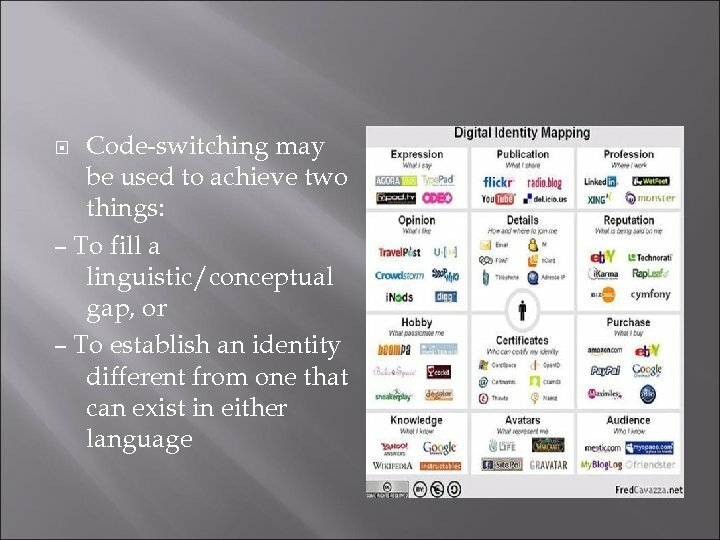 Where code-switching is the norm it is perceived as fluid, unmarked, and uneventful, and where it is the exception it will be perceived as marked, purposeful, emphasisoriented, and strange. • • • Speakers communicate fluently, maintaining an even flow of talk. No hésitation pauses (aw, uhm, uh, er), changes in sentence rhythm, pitch level or intonation contour mark the shift in code. 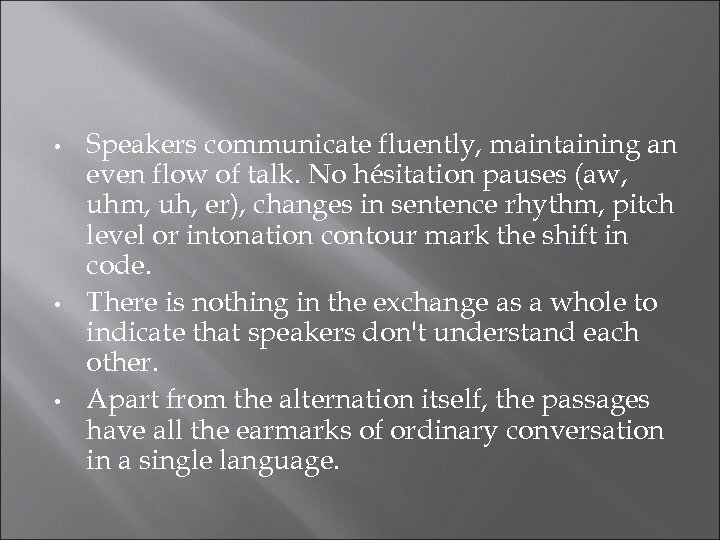 There is nothing in the exchange as a whole to indicate that speakers don't understand each other. Apart from the alternation itself, the passages have all the earmarks of ordinary conversation in a single language. 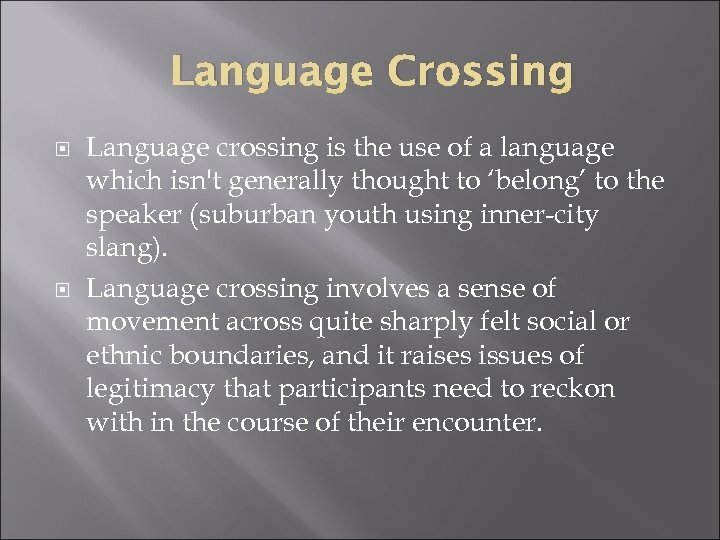 Language Crossing Language crossing is the use of a language which isn't generally thought to ‘belong’ to the speaker (suburban youth using inner-city slang). 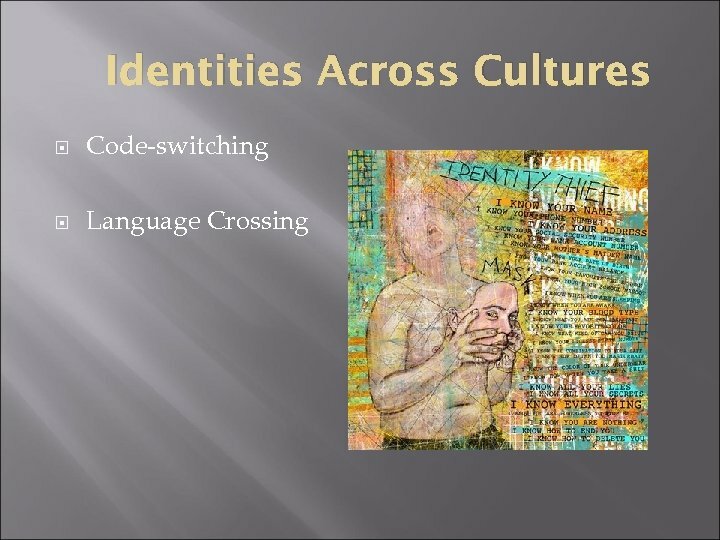 Language crossing involves a sense of movement across quite sharply felt social or ethnic boundaries, and it raises issues of legitimacy that participants need to reckon with in the course of their encounter. 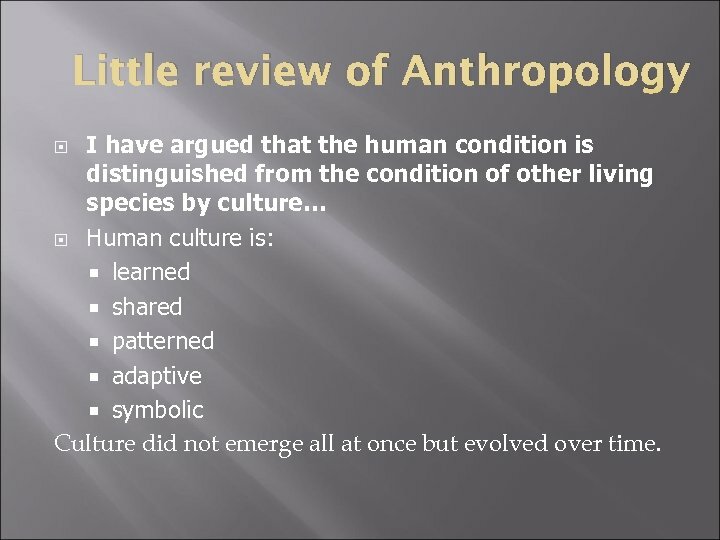 Little review of Anthropology I have argued that the human condition is distinguished from the condition of other living species by culture… Human culture is: learned shared patterned adaptive symbolic Culture did not emerge all at once but evolved over time. 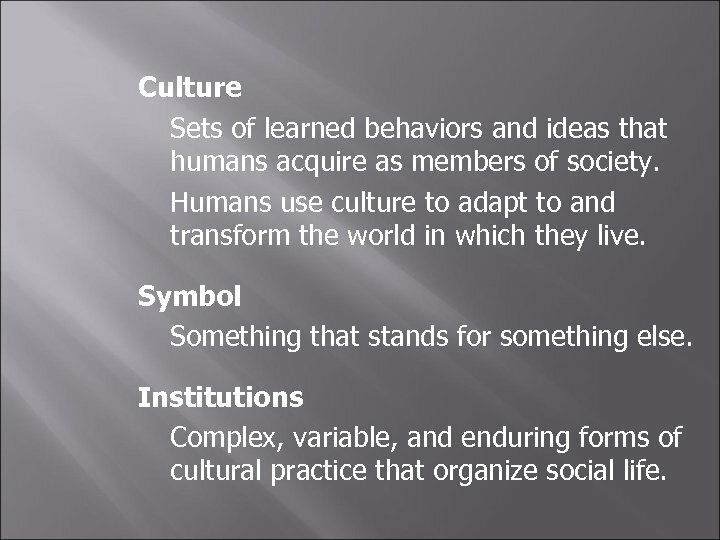 Culture Sets of learned behaviors and ideas that humans acquire as members of society. Humans use culture to adapt to and transform the world in which they live. Symbol Something that stands for something else. Institutions Complex, variable, and enduring forms of cultural practice that organize social life. The role of culture in human life is often debated in the Western world, using concepts rooted in philosophy. Dualism The philosophical view that reality consists of two equal and irreducible forces. 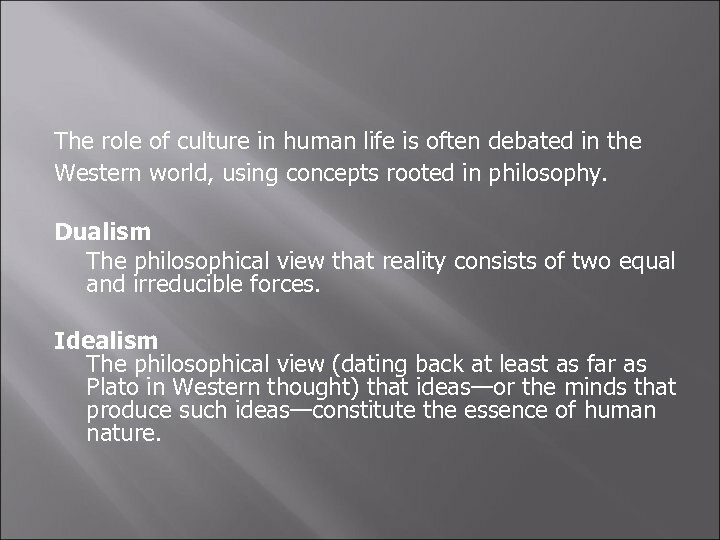 Idealism The philosophical view (dating back at least as far as Plato in Western thought) that ideas—or the minds that produce such ideas—constitute the essence of human nature. Materialism The philosophical view that the material activities of our physical bodies in the material world constitute the essence of human nature. 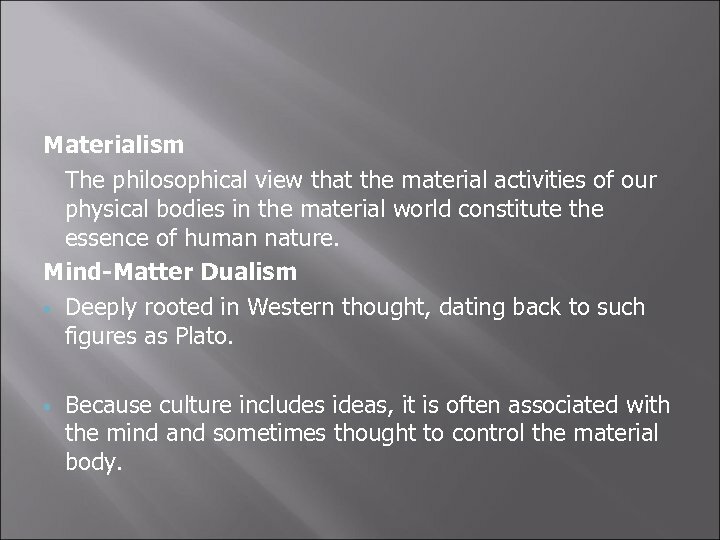 Mind-Matter Dualism Deeply rooted in Western thought, dating back to such figures as Plato. Because culture includes ideas, it is often associated with the mind and sometimes thought to control the material body. 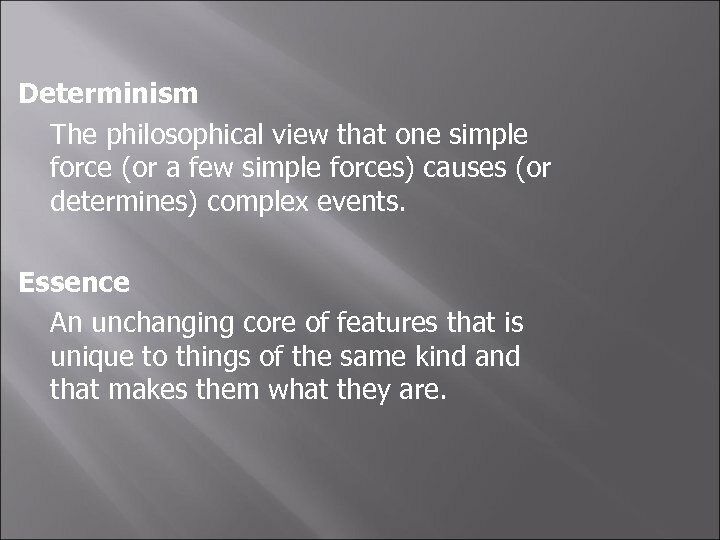 Determinism The philosophical view that one simple force (or a few simple forces) causes (or determines) complex events. Essence An unchanging core of features that is unique to things of the same kind and that makes them what they are. 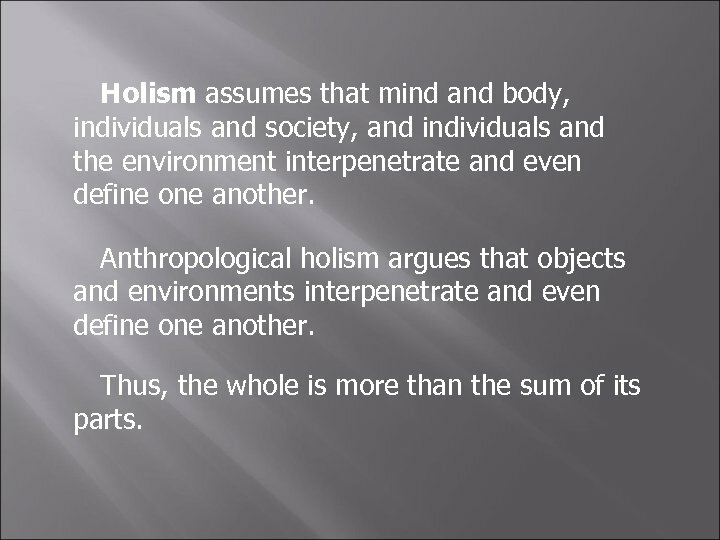 Holism assumes that mind and body, individuals and society, and individuals and the environment interpenetrate and even define one another. Anthropological holism argues that objects and environments interpenetrate and even define one another. Thus, the whole is more than the sum of its parts. Human beings and human societies are parts of open systems that cannot be reduced to the parts that make them up. 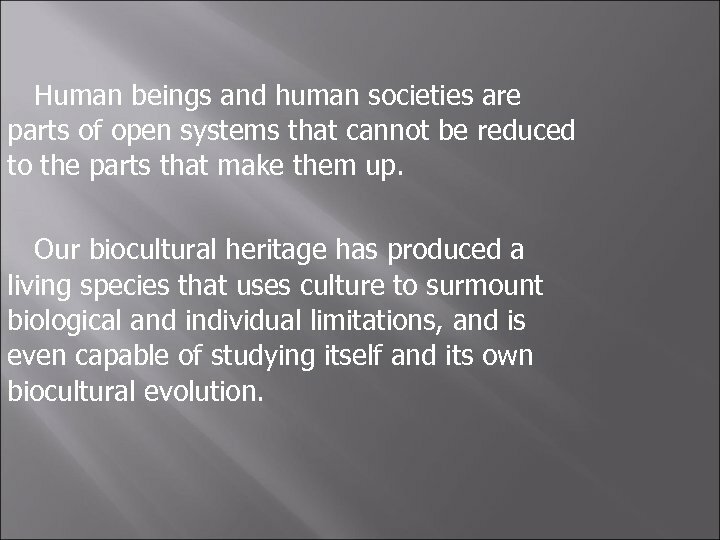 Our biocultural heritage has produced a living species that uses culture to surmount biological and individual limitations, and is even capable of studying itself and its own biocultural evolution. Can culture explain everything? 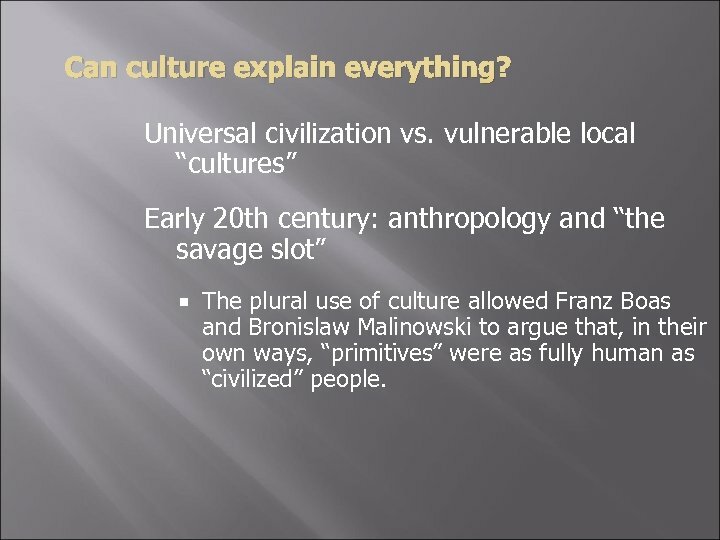 Universal civilization vs. vulnerable local “cultures” Early 20 th century: anthropology and “the savage slot” The plural use of culture allowed Franz Boas and Bronislaw Malinowski to argue that, in their own ways, “primitives” were as fully human as “civilized” people. 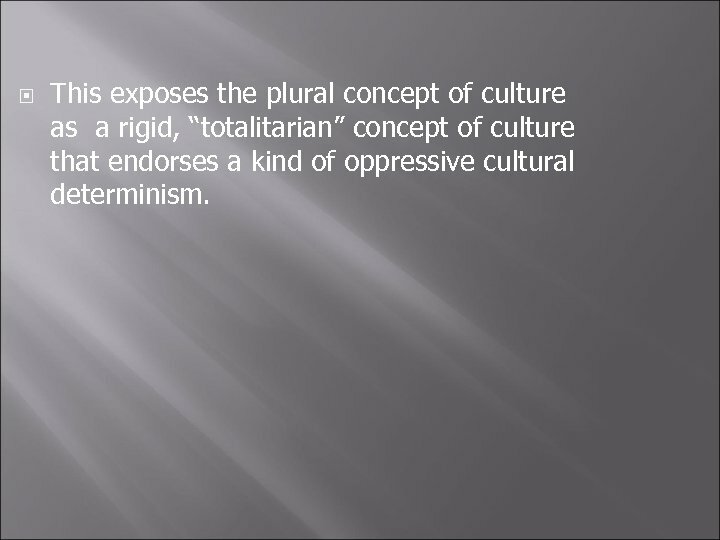 This exposes the plural concept of culture as a rigid, “totalitarian” concept of culture that endorses a kind of oppressive cultural determinism. 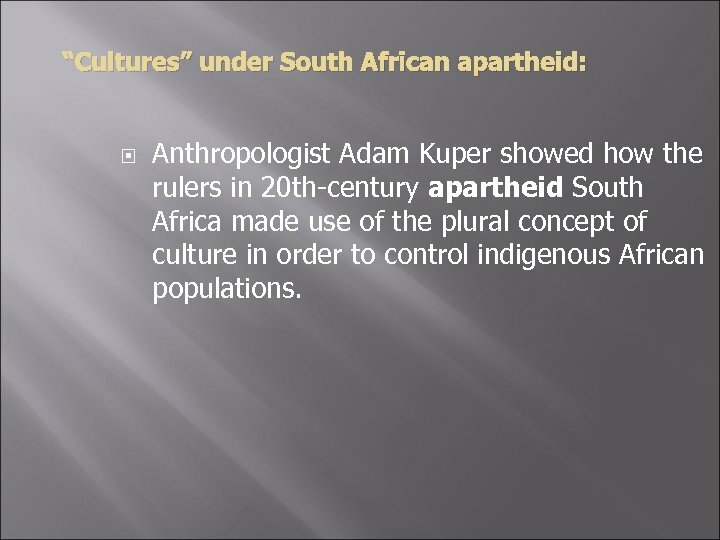 “Cultures” under South African apartheid: Anthropologist Adam Kuper showed how the rulers in 20 th-century apartheid South Africa made use of the plural concept of culture in order to control indigenous African populations. 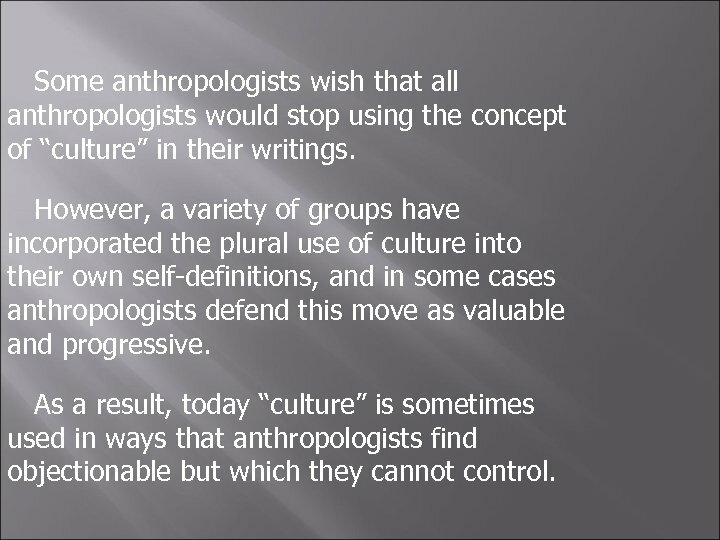 Some anthropologists wish that all anthropologists would stop using the concept of “culture” in their writings. 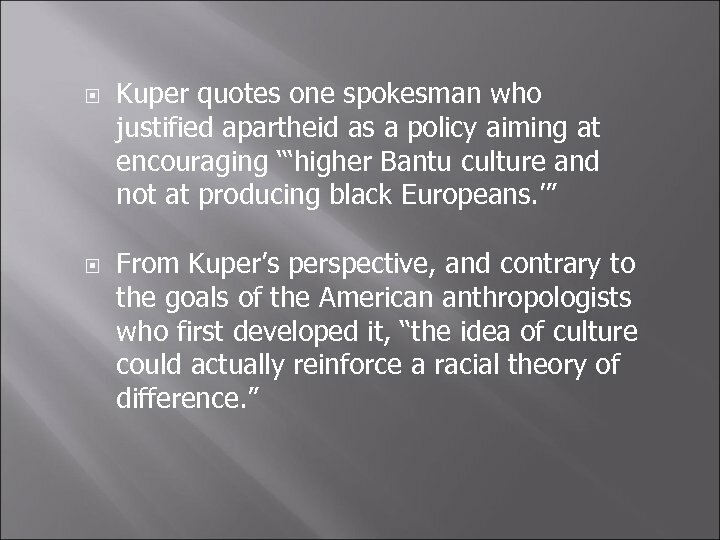 However, a variety of groups have incorporated the plural use of culture into their own self-definitions, and in some cases anthropologists defend this move as valuable and progressive. 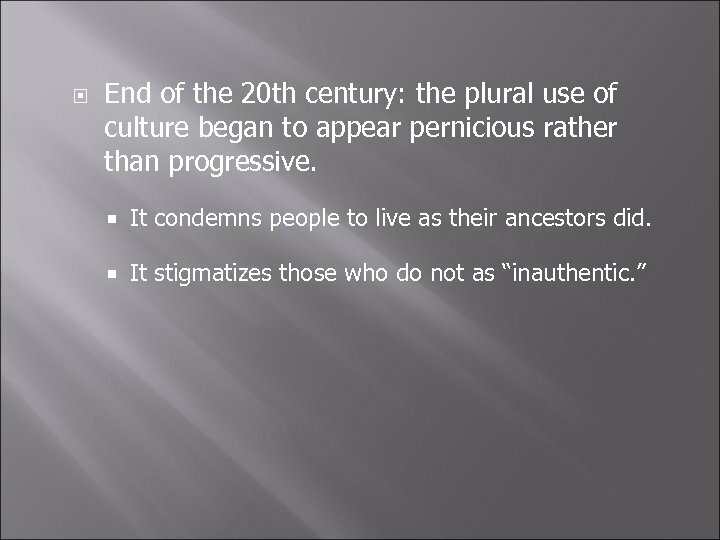 As a result, today “culture” is sometimes used in ways that anthropologists find objectionable but which they cannot control. The anthropological perspective on the human condition forces us to question the commonsensical assumptions with which we are most comfortable. Nevertheless, the anthropological perspective can also help us construct more realistic and authentic ways of coping with those complications. Agency is a philosophical concept of the capacity of an agent to act in a world. The agency is considered as belonging to that agent, even if that agent represents a fictitious character, or some other non-existent entity. 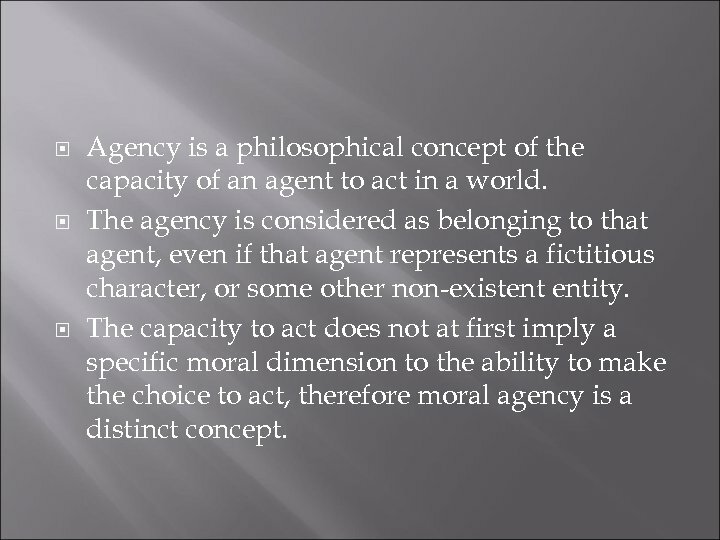 The capacity to act does not at first imply a specific moral dimension to the ability to make the choice to act, therefore moral agency is a distinct concept. 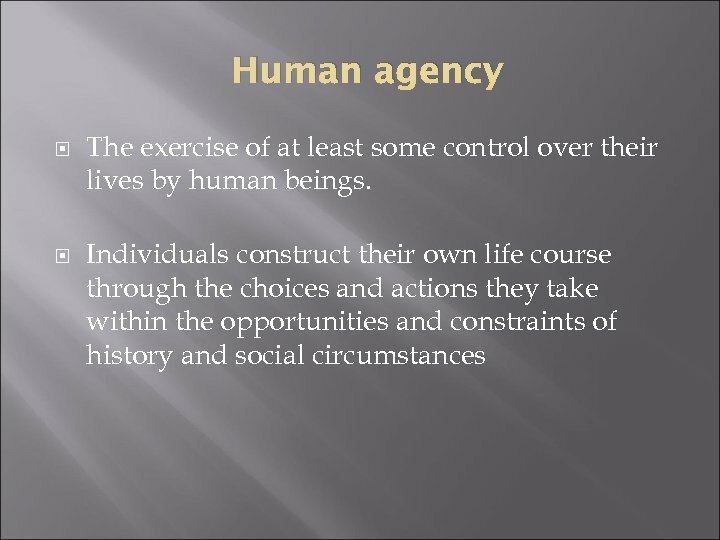 Human agency is the capacity for human beings to make choices and to impose those choices on the world. It is normally contrasted to natural forces, which are causes involving only unthinking deterministic processes. In this respect, agency is subtly distinct from the concept of free will, the philosophical doctrine that our choices are not the product of causal chains, but are significantly free or undetermined. 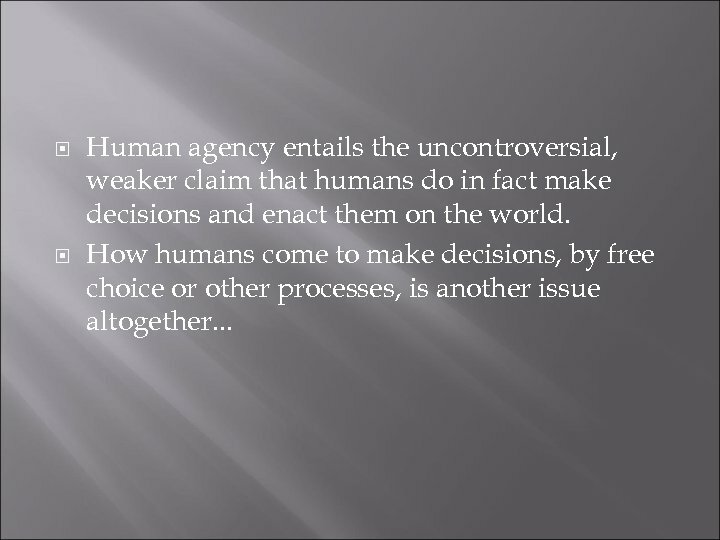 Human agency entails the uncontroversial, weaker claim that humans do in fact make decisions and enact them on the world. How humans come to make decisions, by free choice or other processes, is another issue altogether. . . 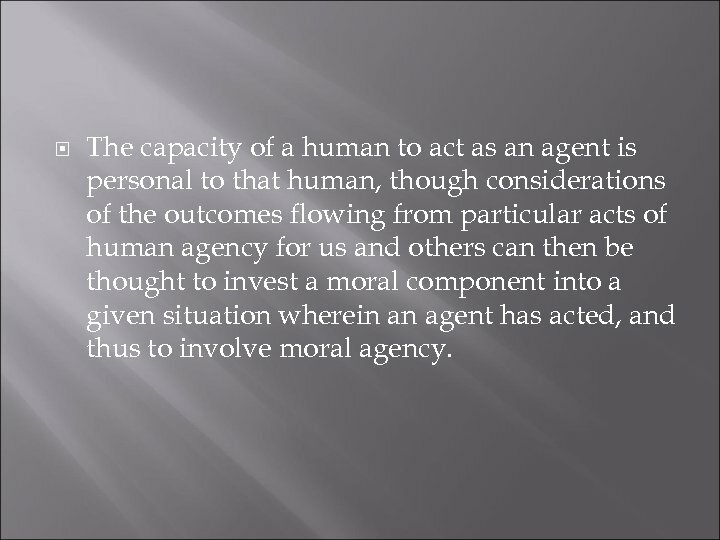 The capacity of a human to act as an agent is personal to that human, though considerations of the outcomes flowing from particular acts of human agency for us and others can then be thought to invest a moral component into a given situation wherein an agent has acted, and thus to involve moral agency. Little if any social action is conducted entirely in the automated mode, but it is increasingly mixed into our daily lives. For example, earlier in the year I asked you to look up articles on your chosen commodity. Human intelligence consisted of you deciding to look up a particular book… Perhaps you also knew how to use the computer and the database you were interested in… Or you were aware enough to ask the reference librarian for help. 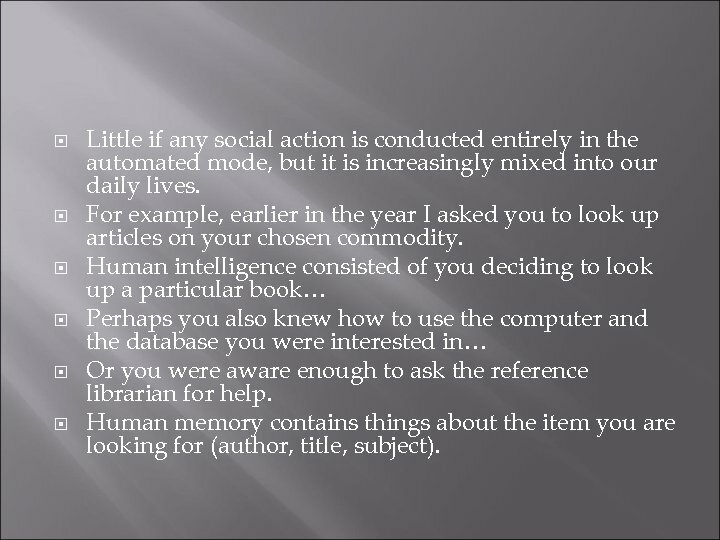 Human memory contains things about the item you are looking for (author, title, subject). 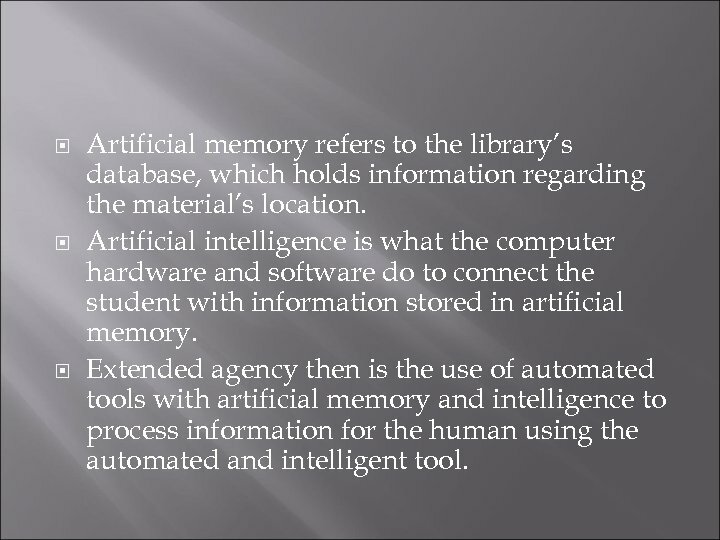 Artificial memory refers to the library’s database, which holds information regarding the material’s location. Artificial intelligence is what the computer hardware and software do to connect the student with information stored in artificial memory. 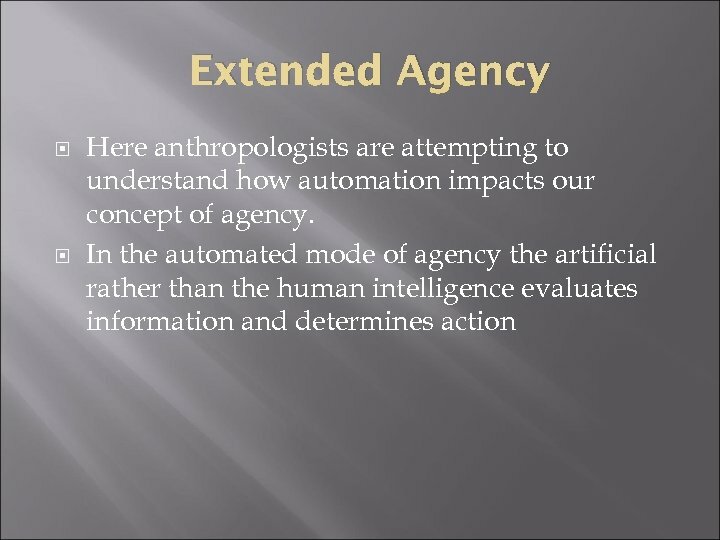 Extended agency then is the use of automated tools with artificial memory and intelligence to process information for the human using the automated and intelligent tool.